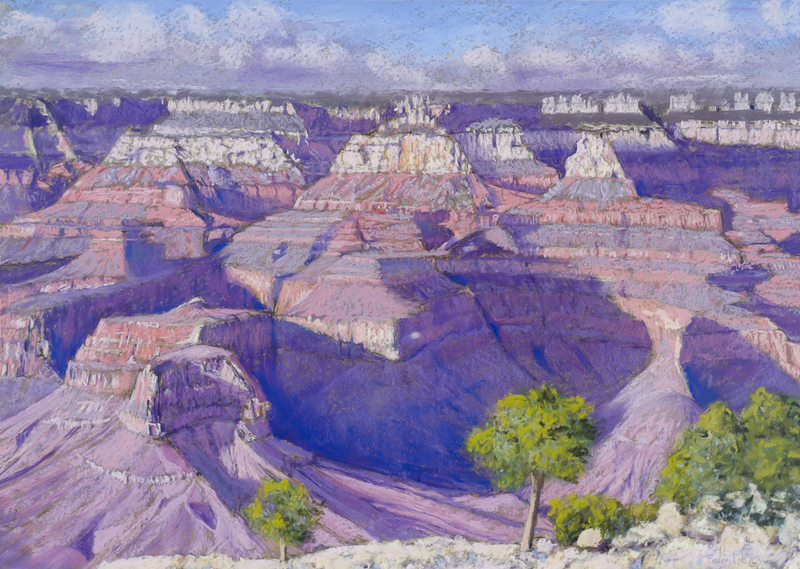 Ray Fedorchak (b.1940) Canyon View pastel 17 x 24″ framed, signed l/r p.o.r. One of the few contemporary artists in my gallery, I consider Ray Fedorchak to be the finest living pastel artist I have ever encountered. Has won many awards for his work. Extremely undervalued. Fedorchak was born in Gary, Indiana and has lived in Illinois, Arizona and Nevada. Since 1976 he has lived in Fallbrook. Fedorchak has been an active painter in pastel since 1986, creating works of art in the Impressionist tradition. He started painting in pastels because of their rich and vibrant colors which express the golden California light that inspires him. He enjoys creating works that are full of action. Those moments that are quiet, reflective and contemplative also inspire him, as they did Edgar Degas, the artist who has been most influential on his work. Fedorchak has studied in classes and workshops under nationally known pastel artists such as Daniel Greene, Sally Strand, Carole Katchen, Leslie B. DeMille, Frank Tauriello and Albert Handel. He has also studied with local artists Ken Goldman, Clifford Nicolides and Alexander Chidichimo. His prize-winning work has been in numerous exhibitions and is in many private collections. His work was on the cover of The Pastel Journal, a national publication, in October 2002. He is a founding member of the San Diego Pastel Society and a member of the Fallbook Art Association. Fedorchak has been Featured Artist at Brandon Gallery several times.